Egypt's military says two soldiers and six jihadists killed in a "foiled" suicide bombing in the Sinai Peninsula. Egypt's military said on Wednesday that two soldiers and six jihadists were killed in a "foiled" suicide bombing in the Sinai Peninsula, AFP reported. The bomber had taken advantage of a fog to creep up on an army "installation" when troops spotted and killed him, the military said in a statement. The Islamic State (ISIS) group also claimed Wednesday's attack in a statement on its propaganda news agency Amaq. The military said five other jihadists were killed in ensuing clashes. The latest incident came two days after ISIS jihadists killed 18 people in an attack on Monday on a security convoy in Egypt's North Sinai. 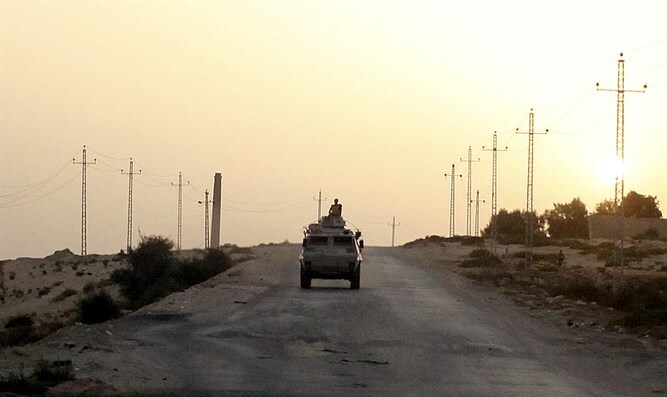 The attack took place when a vehicle tried to break through a security convoy passing between Qantara near the Egyptian port city of Ismailiya, and El-Arish, the capital of North Sinai. Monday's attack was one of the deadliest in a jihadist insurgency in the Sinai Peninsula that has killed hundreds of troops and policemen. Most of the attacks in the region have been claimed by the Sinai Province, ISIS’ Egypt affiliate which pledged allegiance to the jihadists in 2014. In addition to its attacks in the Sinai, Sinai Province has carried out attacks elsewhere, including in Cairo, and has claimed attacks that have killed more than 100 Coptic Christians since December. Coptic Christians make up about 10 percent of Egypt's population. In 2015, ISIS released a video purportedly showing the beheading of the Coptic Christians it had captured in the Libyan capital Tripoli.